A view from the cycle path: The myth of the "standard Dutch junction"
The myth of the "standard Dutch junction"
Before starting his own blog, Mark Wagenbuur made videos for some of my posts and then became a regular guest blogger here. Some of the blog posts and videos that he made for this blog are still quite popular. In April 2011, Mark wrote a blog post in which he criticized a dangerous junction design suggested by the then new and claimed to be "state of the art" US NACTO design guide. I thought this to be a very good blog post. At that time we would discuss posts before publication and the only thing that I asked to be changed was that the article should include a reference to other types of junction such as the more modern simultaneous green design. That was added before anyone read the post. a design which should be copied. Mark tried to demystify how traffic light junctions in the Netherlands worked and he sketched out how Dutch ideas could be applied to the mock-up American junction from NACTO in a video. The object was not to design a real junction. His approximation consisted of on-screen graphics based upon the dimensions of the original NACTO graphic in order to try to show that a safer type of junction could be built within the same dimensions. Many people misinterpreted what Mark had written about and between us we wrote some additional notes which were added to the blog post in order to try to explain. This confusion continued so Mark wrote a second post to follow the first a month later in an attempt to explain yet more misconceptions. This again included information about more modern solutions, referring to the simultaneous green design and the use of roundabouts instead of traffic lights. I've re-read both of Mark's blog posts and I still see nothing wrong as such with what he said. Perhaps the problem is what he didn't say. Somehow people keep reading something other than what was written. 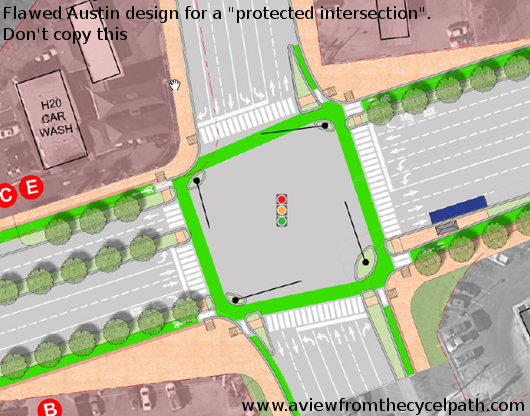 Rather than seeing Mark's sketch as an approximation of a Dutch junction created with the aim of dissuading NACTO from promoting a dangerous design, people now appear to be using his sketch as a design guide in itself. right turn. Also, the geometry is wrong. This would require sharp turns. Versions of this junction "design" now pop up everywhere. They've even reached the opposite side of the planet.. Unfortunately, as the idea that this is somehow a good design has taken hold, many of the key points of the real design and of Mark's argument were lost. What's more, alternatives that are more common in the Netherlands, safer and more convenient for cycling are being ignored in favour of pursuing this one design. 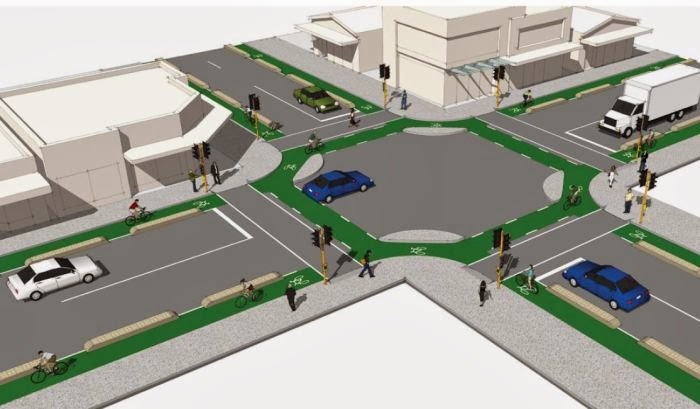 In Christchurch, New Zealand, a design which superficially looks similar to Mark's sketch is referred to as "the Dutch intersection", though their design departs in several ways from any real Dutch intersection through which I've cycled. Is this just a matter of language ? Has this design been picked up so widely for no reason other than that Mark referred to this as "Dutch standard junction design" ? Was the confusion caused by a matter of English usage ? Junctions which look similar to his sketch are not "standard" in the sense of being "to a standard" but "standard" in the sense of being unexceptional. i.e. there's nothing special about this in the Netherlands. It may even be inferior. Is it because people view the video in isolation from reading the related blog posts so don't ever see the explanations ? Why are engineers and planners trying to design infrastructure based on what they've read on blogs, watched on Youtube and looked at through Google Streetview when it is possible to come and see the real thing being used in a real context ? In Assen we have no junctions at all which are of this design. is now planned to be removed in the very near future. Only one junction near the railway station has a strong resemblance to this design. This is pictured to the right. This is the only junction in Assen where a commonly used left turn requires use of two traffic lights, both of which are likely to delay you. The design dates from the late 1980s when the existing railway station was built. Over time, many traffic lights have disappeared in Assen and this one will be next. Plans are very well advanced for the replacement railway station and as part of this work through motor traffic is to be redirected through a tunnel which will make these traffic lights superfluous. In future, the cycle-route between the railway station and the centre of the city will have no traffic lights on it. I have to cycle quite a long way to find a junction which is really similar to Mark's sketch. About 40 km South of here in Hoogeveen there are some older junctions which have not yet been reworked. One of them is known to me because it is one of two slightly inconvenient points for me, where I am slowed and delayed on a route which I have cycled fairly frequently to visit a friend who lives 100 km south from here. Older designs simply are not so good as newer designs and they should be where inspiration for other nations comes from. If you are inspired by the Netherlands, take your inspiration from the good stuff. There is no "Dutch Standard Junction Design"
There is not really such a thing as a standard Dutch junction. In fact, every junction is designed to fit a particular space and is designed with the needs of the traffic in that space. Another blog post shows every traffic light in Assen so you can see the great variety of designs used. In the 1980s it may be been acceptable to expect cyclists to make slow two stage turns but that is a last resort measure now. The best junction for cyclists at any particular location is whatever can keep cyclists safe while not causing slowing, deviation from a straight line or stopping. 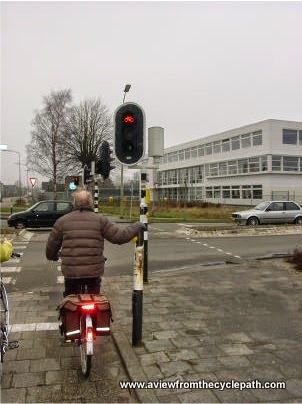 In practice, this is achieved in Assen by unravelling routes for drivers from those used by cyclists so that cyclists do not have to interact with traffic lights installed to manage motor vehicles. Where cyclists do have to use the same junctions as drivers, they are often provided with simultaneous green traffic light designs (the safest and most convenient option) or roundabouts. Junctions between large roads in the Netherlands often don't need to cater for cyclists at all. These include traffic light junctions where cyclists have another route and "turbo roundabouts" which provide convenience for drivers. This special type of roundabout is entirely designed around driving and cyclists have other routes. Dutch Junction" is something like this. Most junctions in the Netherlands are on residential streets or in town centres where low speed limits, raised tables, special surfacing, small corner radii and one-way systems which apply to drivers only make them unattractive to drivers. These do not operate as through streets for motor vehicles. On such streets, you meet very little motorized traffic and these junctions do not require traffic lights on them. Where cyclists and motorists do have to use the same junctions, there are many options, not just one. Roundabouts with separate infrastucture for cyclists are very commonly used, for instance. We demonstrate a wide range of solutions on our cycling infrastructure study tours. 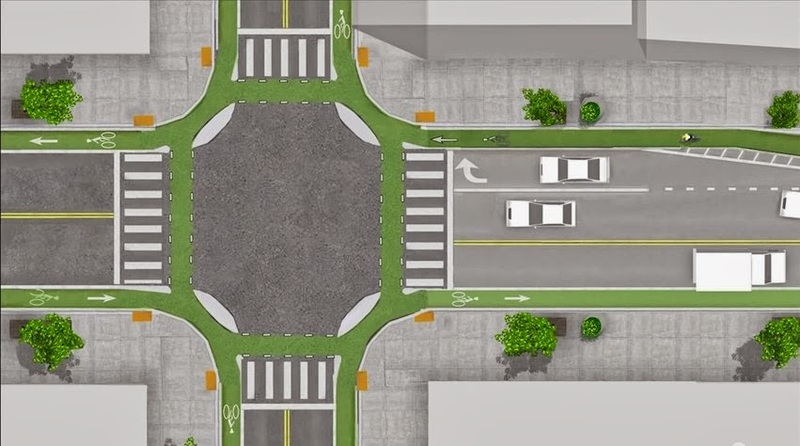 Not only does this video show a junction design, it also includes car parking in the right place relative to cycle-paths, so there are good aspects to this. It's late as I type this. I've just watched the new video and these are my first impressions. While watching the video, I kept expecting the author to trip up at some point or another, but he does seem to have almost everything covered. Overall, I'm impressed. The video necessarily covers much of the same ground as did Mark's video and I'm very pleased to see that Nick acknowledges that debt. I'm also quite pleased to see that he acknowledges influence from this blog and other sources. The incorporation of simultaneous green into this junction is not quite right from a Dutch point of view because the geometry of real simultaneous green traffic light junctions is different to this junction. The "corner refuge" will get in the way of the most efficient use of the junction where diagonals are allowed. However, in my view this wouldn't stop the junction being able to work at all in that way and of course we do have to proceed in steps. If the US can start to install civilized junctions based on this design then we will perhaps see variations including more Dutch style simultaneous green in future. The devil is very often in the details of implementation. If dimensions are adequate, traffic light timings are adequate, if cyclists have separate traffic lights and motorists can be prevented from making right turns on red (which I know many US motorists expect to be able to do) then I think the design will work well. However, that's quite a list of details. Quite a list of things which could be got wrong if the junction can't be built to the standard that it needs to be built to. I hope that Nick can prevent that from happening. There is also the not so small matter that this design represents an Americanized version of just one of the many tools used by Dutch planners. This design of junction is only used at a minority of intersections in many Dutch towns. It is certainly an advance for the USA if this type of junction can be built, but please also look to the other interventions taken in the Netherlands but it should not be over-applied. Most of the places where we could have a junction like this in Assen, for instance, are now places without traffic lights at all. Understandably, it may take a little time for those other ideas also to be imported to the USA. For cyclists, well designed Simultaneous Green junctions are more convenient than every having to make a two stage turn. Roundabouts are also more convenient. However, it's most convenient of all to have no traffic lights or other major junctions which need to be negotiated when cycling. It's the "second revolution". i.e. getting rid of through traffic in cities and therefore also being able to get rid of the traffic lights and wide roads required to control motorized traffic which has done much to civilize Dutch city centres. This is more of philosophical approach than merely moving concrete, and it's perhaps too much of a leap to make immediately. But this where the big prize is. Few Dutch people would now vote for a return to what streets looked like in the 1970s. John Pelletier pointed out another possible pitfall in email: "One thing that I noted he missed and mentioned in the comments is the issue of drivers not stopping at the stop line and blocking either the bike lane and/or ped crossing. In the US the standard is to put traffic lights at the opposite side of an intersection, I am sure this contributes quite a bit to folks not stopping at the stop bar. I notice in many instances the Dutch bring the traffic lights close to the stop bar so that going past the bar means you have no idea if the light is red or green, this confusion forces folks to more likely stop behind the bar". In the Netherlands, the traffic lights for cars are always just beyond the stop line, not on the opposite side of the road. If drivers pass the stop line then they can't see whether the light is green or red. On of the reasons why I am enthusiastic about this video is that Nick works for Alta Planning and Design. I've criticised this company in the past because they were involved in design standards and plans which I consider to be inadequate (e.g. Ontario and Los Angeles). Alta were also involved in work for NACTO which prompted Mark's video and blog post to which this is a reply. Nick's video criticizes older, more dangerous intersection designs (e.g. two stage turns and merging right turning cars with cyclists) which Alta appears to have supported in the past. These same designs as were also criticized by Mark and myself amongst others. If Nick is the new face of Alta, and this type of design is the sort of thing that we can expect the company to advocate in the future then that's a very good thing. Alta would appear to have altered its recommendations in the light of what has been learnt. I hope to find that Alta will from now on pursue this better design and not merely advocate it alongside the inferior designs. This could be a very good first step for America... but you do eventually also need to do the other things. NACTO appear to have adopted Nick Falbo's design. I asked NACTO to let me know whether the new design will replace existing, less safe and convenient, junction designs in their standard or whether it will appear beside these inferior ideas. While it is an advance for NACTO to adopt this design, there is a risk that this design could well end up being the best option alongside a range of inferior options in the toolbox available to American planners. In the Netherlands, junctions like this are an average option offered alongside several superior options in the Dutch toolbox. My concerns about this type of junction being over applied are still valid. Is this for countries outside North America ? There is no reason for countries outside North America to seek to emulate the NACTO guidance. With the adoption of this design, NACTO's best solution for cyclists is a copy of an average solution in the Netherlands. Come directly to the source. There is now a proposal for a real implementation of the "protected intersection" in Salt Lake City in the USA. Unfortunately, this departs from the the best recommendations of Nick Falbo's video. One of the most important things missing from the Salt Lake City design is that there are to be no separate traffic lights for cyclists. This creates a dangerous conflict between drivers turning right and cyclists going straight on or turning left. This is similar what occurs in "mixing zones" which have proven to have fatal outcomes elsewhere. The drawing also makes it appear as if the kerb lines on the cycle-paths are intended to impede cyclists. This is not a feature of Dutch junctions where widths and radii are quite generous on cycle-paths to ensure that people can cycle efficiently. In my view it is still unfortunate that the superior simultaneous green design wasn't adopted for this experiment. That is far more efficient for cyclists and avoids all the dangerous conflicts. In this example there is no safe way of exiting the junction to head East or North. The buffer only gets in the way of cyclists and makes it difficult for them to join the road in those directions forcing two 90 degree turns where there would otherwse be no requirement to turn at all (for a cyclists going straight on through the junction). It is possible to join segregated junctions with roads which don't have segregated infrastructure in a seamless and safe manner, but no attempt at all has been made to do that at this intersection. The only direction in which cyclists are actually protected by the buffer is if they proceed from the west and turn right. i.e. this "protected intersection" protects cyclists from motor vehicles in only one of the twelve different directions in which it can be used by cyclists. 1/12. This example is on a huge road which certainly requires separation of cyclists from motorists by use of separate traffic lights. Cyclists who are late in crossing the road have absolutely no refuge between eight lanes of traffic. No do pedestrians have a refuge. Cyclists heading South and wishing to go straight on or left have a dramatic diversion from a straight line which they have to negotiate before finding themselves in front of motor vehicles which were making a right turn with a far more generous corner radius, leading to higher speeds around that corner. Cyclists coming from the west and wishing to continue North are first placed in conflict with one lane of right turning cars heading south and then placed in conflict with two lanes of cars going in a straight line towards the East. In this case, right turns are protected by the buffer in all four cases, but neither straight on or left turning cyclists have any protection at all. 4/12. These appear to be nothing more than "cargo cult" copies of Dutch designs. The subtleties of the real designs have not been understood at all and some ideas from a third-hand half-remembered idea which could perhaps have worked at a relatively small intersection with little traffic have been scaled up to form the basis of a design for a completely different context. This seems to have happened without any real thought as to how it will work in practice. These intersections are not genuinely similar to Dutch intersections - they merely look superficially similar to designs which work at some places in the Netherlands. At a real-life large scale Dutch intersection with many lanes on the road, the cycling facilities are completely separate from the driving lanes. Cyclists are assured absolute safety because they use completely separate traffic lights which remove all conflict between cyclists and drivers. This example would have made a far more suitable starting point for the Texas intersections than the design for much smaller intersections which they tried to scale up. If they'd sent people here, or even just asked sensible questions, we would have shown them this. Before wasting more asphalt, before putting people in danger through bad design, come and see how real intersections in the Netherlands work. In both these cases I've given directions relative to the pictures, assuming that North is at the top of the picture. Mark criticized just one feature of the NACTO design guidelines. Read my longer critique of Ontario's design guide, which shares many similarities as well as authorship with the NACTO guidelines. That Christchurch design would be very confusing to do a two-stage turn on. Once you have crossed the first arm, where do you line up? The traffic light governing the crossing of the second arm would be behind you. It's clear that a signaled intersection and a two-way turn is not an ideal solution for cyclists. However if space is at a premium and there's a lot of traffic, including transit, that might be the only solution there is. It think what characterizes the Dutch intersection and that was underlined in Mark's posts and videos is that cyclists get to wait for the green not with the cars, but to the left of the pedestrians and thus being more visible to the drivers and being able to cross the street before right-turning cars get to the point of conflict. Also there's a traffic island at the corner that prevents cars cutting through the bike path. But even that sometimes isn't achievable due to lack of space. For instance in Amsterdam on certain intersections cyclists have to stop almost in line with the cars to because there's no room for waiting at the corner. I have to say I'm a little amused by all this. Time and again on this blog it's become apparent that the authors are not actually all that aware of the context in which its content is being received. And it is this fact that explains "there still seems to be a problem. Somehow people keep reading something other than what was written". North American, and I suspect Australasian, cycling advocates are almost entirely looking for designs that can be adopted into downtowns, not the suburbs. Our suburbs are pretty much a lost cause for another generation at least; there is simply no point in NA cycling advocates trying to get cycle-friendly designs into the suburbs when most of the demand for cycling infrastructure, such as it is, is in downtown environments. So showing large roundabout junctions from suburban Assen, while interesting, has precious little immediate application to much of the audience because they take up too much space. Really, they do. North American downtowns typically consist of a rectilinear grid of streets that are 50' (15 m) to 66' (20 m) wide. That NACTO design, for all its faults, was designed to fit into such a space. So when Mark modified it, he, perhaps quite unintentionally, produced a template for an intersection design that could become quite common due to the sheer enormity in numbers of such 66'x66' intersections. His design was one of the first I had ever seen on this blog that struck me as one with the possibility of widespread application in North American downtowns. And that probably explains why it spread all over the place. Simply put, if an intersection design doesn't fit into a 20 m x 20 m square, it's not useful to a large share of the audience. David: The road network in this city dates back as far as 750 years in some parts. It was not designed to provide generous space for huge road junctions. This isn't an issue of us having more space than you do. Regardless of its size, not one of the junctions in this city is of the design which you seem to be so determined to copy. The design that you are copying from is not used here because it's not a good design. It has nothing to do with us having lots of space, because we don't. I've documented pretty much every single junction in Assen now as well as many elsewhere. Junctions of all sizes have been discussed. Today's blog post is about every single traffic light junction in this city. A previous post showed every single roundabout in Assen. There are a multitude of better ways to design junctions, using both traffic lights and roundabouts as well as the more common option of having neither traffic lights nor roundabouts but instead controlling the amount of motorized through traffic. Given the abundance of choices, it's mystery to me why anyone would fixate on something which was clearly never intended to be anything more than an illustration. It's also a mystery to me why you would ignore the proven good designs that the Dutch choose for similar sized junctions. By pushing this type of junction design you are choosing something inferior to what Dutch cyclists expect in similar situations. You're pushing a design which is near extinction in the Netherlands and using it in inappropriate places. The Dutch don't have one design. Rather, they have a multitude of solutions (documented on this blog) and they are used for the locations where they fit. We demonstrate this to anyone who cares enough to actually come and see for themselves. Some study tour participants bring tape measures precisely so that they can compare exactly like for like junction sizes. To see some of the variety of traffic light junctions used in the Netherlands, take a look at today's blog post in which I write about every single traffic light in Assen. That's every one, whether in the suburbs or the city centre, regardless of size. And you still don't get it. I'm not "determined" to push Mark's modified NACTO junction, or any other. I was trying to offer insight into why that design got so much attention compared to all the others, something which you admit yourself is a mystery to you. You can accept that insight, or reject it, but don't infer that I was lending support to or "pushing" the design itself. I've read this blog for a long time and while I find it interesting I've also long realized there really isn't much for someone from a North American downtown to make use of from your blog; "interesting" and "applicable" are two very different beasts. Let's take your other post from today, the one on all the traffic light intersections in Assen. Of them, only intersections 9 and 23 (barely) fit into a 20 m x 20 m square (I include everything to the outsides of the sidewalks). 19 would fit without the generous right turn radii, but since it's car-only there's nothing to learn. The western half of intersection 22 clocks in just above 20 m, while the eastern half vastly exceeds this. So in all of Assen, there are just 2 traffic signal-controlled intersections with any possibility of fitting into a typical North American downtown intersection. Of these two, 9 has an arrangement unlikely to be duplicated in a downtown environment - the side-aligned two-way bikeway - and 23 has an odd combination of a two-way street turning into a one-way street. So, basically, there's nothing in Assen for North Americans coming to learn about cycling infrastructure could even hope to adopt in their downtowns, simply because most of the traffic-signalled controlled intersections in Assen won't fit into North American downtown intersections. 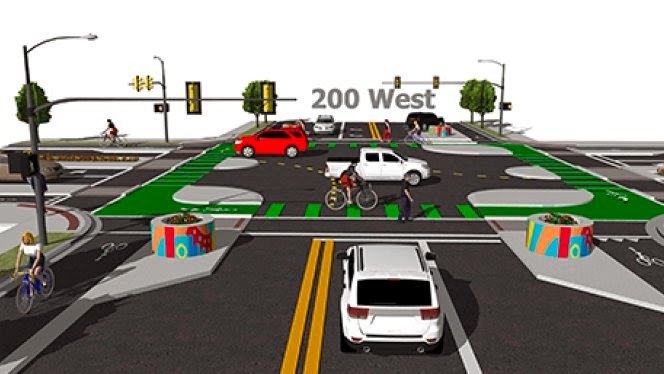 Which gets us back to Mark's modified NACTO intersection: whatever its merits or detractions, it at least fits into the spaces most North American cycling advocates are interested in, unlike pretty much everything else on this blog. That's the challenge we on this side of the Atlantic face: how to design a cycling-friendly traffic signal-controlled intersection that fits into a 20 m square. David, have you actually been to the Netherlands ? I've been to the USA and I can tell you that your roads are huge by comparison with here. Your junctions are also huge. Indeed, I just went to Google Maps, zoomed in on a random spot around New York and found this. Huge junction. Easily enough space for Simultaneous Green. We have that on much smaller junctions. There are any number of others. I scrolled a few hundred metres east and found another ideal location. I think the problem you're having is that you are simply looking in the wrong places and trying to apply a solution which does not exist in a place where it does not belong. What you're seemingly trying to do is to apply a 1950s/1960s methodology of installing traffic lights everywhere. Following the US lead, the Dutch themselves did precisely this in the 1950s and 1960s. The first traffic lights in Assen were installed at this tiny junction which is much smaller than 20m x 20m. However, these days that junction appears as a white gap on my map, as do many others which used to have traffic lights but no longer do. You are not finding them because it was a bad idea for them to exist and so they have been removed. The Dutch have redesigned the way in which streets were used and got rid of traffic lights at small junctions. By trying to shoe-horn in infrastructure where it does not belong, you are not following a Dutch lead. It seems okay to me. He cites Mark Wagenbuur's video in the references. He works at Alta so should be pretty well educated about the many different approaches used around the world. David, do you think that in some cases simultaneous green for cyclists could be used in place of major junction reconstruction? For instance, in Stockholm there are many bad junctions for cyclists, and there has been talk of doing a pilot with the "standard Dutch junction", mainly as a way to protect cyclists agains incidents with right turning motor traffic. Clark: It's only one step out of many, and of course we must wait and see how well it is done, but I think the protected intersection video is a very good sign for America. I've updated the blog post to discuss this. Dmitri: Simultaneous Green is, IMO, easily the best design of traffic light junction for cyclists. This type of junction results in minimising delay and maximising safety relative to any other type of traffic light junction. If you can get a trial in Stockholm, that would be great. If you have cycle paths leading to the junction then in essence, simultaneous green can be trialled by changing just the traffic lights and not requiring the pouring of concrete. Before going on, let's deal with a couple of things. You keep asserting that I am trying to push, copy, apply, shoe-horn, whathaveyou. I am not. I don't know why you keep doing this because there's nothing I've written that would suggest I was or am. I was offering insight into why Mark's design was picked up elsewhere by others. That requires some explanation, which is what I've given. Instead of seeing that explanation for what it is, you've gone on and distorted it into some notion of me pushing something. After having corrected you once, incredibly you went and did it a SECOND time! Please stop ascribing motives to me that I don't have. In addition, stop assuming things about me. I live in Canada, not the USA. I could have sworn I had written "North American downtown intersection[s]" several times and very consistently. Yet... the intersection you zoomed in on isn't a downtown intersection; it's an intersection from suburban New York. It does, as you say, have lots of space and would be quite amenable to the treatments you've shown elsewhere on your blog. And yes, you could scroll across suburban North America and find innumerable examples of huge intersections to which the examples you've shown could readily be applied. That's all fine and good and perhaps in a few decades they'll start getting those treatments. But it's also irrelevant as far as this discussion is concerned. That's because they're not downtown intersections. And more importantly they're also not the intersections that North American cycling advocates concern themselves about. By pointing at them and remarking on all the space you're sidestepping the question and with it the issue that got us here in the first place, which is why Mark's modified NACTO junction became something of a minor internet hit among overseas cycling advocates ("Has this design been picked up so widely for no reason other than that Mark's post referred to this as "Dutch standard junction design" ?"). Here's one such example of an intersection that would be of interest from my city, Ottawa, at Bank along Laurier where the City recently installed segregated bike lanes. Here's another from just outside downtown Toronto (but well within its traditional grid), the city now made infamous by its anti-bike lane crack-smoking mayor. This is Sherbourne and Wellesley, two 66' wide streets which both have bike lanes. Cycle tracks were built on Sherbourne recently, after the Streetview shot. This YouTube video shows Sherbourne to the north with cycle tracks, ending at the intersection with Wellesley. Then there's Vancouver, on their newish two-way segregated bikeway along Dunsmuir at Richards, showing the bike box on Richards to enable left turns from the bikeway to Richards; again, another example of a 20 m square intersection. These are just some of the first examples of attempts to install bike infrastructure into prototypical North American downtown intersections, of which there are literally thousands across the continent and many of which could see bike infrastructure introduced (zoom out from all the above and you will see extensive grids featuring the same intersection size replayed dozens of times). I don't think any of the above have actually been done "properly", but then I haven't seen anything on this blog that would fit into them, either... except Mark's modified NACTO diagram. The latent “demand” for something that can fit into such spaces is enormous, so it really should be no mystery why Mark's design was picked up while the other designs on this blog – which can't fit – were not. I've just look over this new Portland design. At first blush, it looks quite good. However, in light of my concern of 20 m RoWs, I decided to see if I could take an educated guess at its dimensions. The dimension I get* is in the order of 24 m or 75'-80'. That seemed odd to me until I looked at Portland's downtown RoWs: many appear to be 80' rather than the 66' that's typical elsewhere. Still, they have plenty of 66' RoWs as well, so how this design is going to work as depicted where they don't have the benefit of 80'x80' intersections remains to be seen. The basic design problem is that you can't get enough space between the bike lanes and the car lanes when there's a requirement for a centre turn lane at the intersection. As it is, between intersections, there's only enough space in the RoW to get a single line of parked cars, i.e. on one side or the other. Add some sidewalks - minimum 2.0 m each - and we're at 24 m.
David: We seem to be going around in circles. As I pointed out in my last response, you are asking for something which does not exist. Dutch "downtown" junctions look like these examples. The last few paragraphs of your last comment makes it obvious where you're coming from. You start with discussing "2x3.0m thru lanes + 1x3.5m L-turn lane + 2x2.5m parking lanes", thereby already allocating almost the entire road surface to motor vehicles before even considering the space taken by bike paths or sidewalks. The approach that you are taking of talking about how much space is required for motorised traffic before considering what is left over for people walking and cycling in the city centre is very similar to what happened in the Netherlands in the 1960s. However, it's not the approach taken in the Netherlands since the 1970s. City centre streets now prioritize people over through traffic. If you look at the examples then you'll likely find that photos of Dutch streets from the 1960s and early 1970s look more familiar than do Dutch streets now. To summarise, you're trying to find examples of something that doesn't exist. Furthermore, there's a very good reason why it doesn't exist. It's the wrong approach. Dutch cities do not feature one design shoe-horned into all places, but a multitude of solutions each (hopefully) applied in the right places. I am positive about Portland's attempt at a "Dutch" intersection because at least they seem to have got the details of it more or less right. However, I am still concerned that they will try to over-apply this one solution rather than use all the other (better in the right places) solutions that the Dutch have. You'll note that I've already written about my concerns above. I am at a loss, as you must be, that your discussion has been so miscontrued. I recently found misuse of the "standard Netherland" intersection at https://vimeo.com/86721046. It may be that you offer too much text and not enough clarity that the designs have their share of problems. Fairly recently, strong advocates of "bikes belong in the traffic lane" have made a good case for using the same parts of the roadway as motorized traffic. That habit avoids many potential collisions at intersections. Alta might be headquartered in Portland, but one staff member's conceptualizations do not make such concepts a 'Portland design'. As a designer with the City of Portland, I would appreciate discontinued use of the term. the space required for the concept is only the first of my concerns. Until the safety of cyclists is more important than parking space for cars, not much progress for cyclist safety will be made in NA cities. Portlands most common RoW width is 50 and 60 feet, and downtown is a grid of one-way streets with 18-20 mph progression and 90% signalised. What we struggle with, apart from parking demand, is designs that accommodate the 8-80 vision. Our own cyclist community can't agree on vehicular versus separated cycling. Just a quick note. One thing to remember is that the Protected Intersection concept is not from Alta but an individual who happens to work at Alta. Indeed we are going around in circles. We're going around in circles because you keep insisting on interpreting my comments as trying to achieve something other than providing information. I've corrected you TWICE before on this, and this is now the THIRD time you've been corrected on this. Please try not to do it again. So let's just be very clear on this since you have demonstrated a great deal of trouble understanding this concept to date: I am DESCRIBING NOT PROPOSING. Got that? DESCRIBING NOT PROPOSING. In the last iteration of this serial misunderstanding, you write "the last few paragraphs of your last comment makes it obvious where you're coming from..." and "the approach that you are taking...". Except you must have missed the part where I was DESCRIBING something else; I wasn't coming up with or proposing a design. I was analysing a proposed design; someone else's, not mine. Did you miss the bit where I wrote "in light of my concern of 20 m RoWs, I decided to see if I could take an educated guess at [the Falbo design] dimensions"? EDUCATED GUESS. Not "here is what I am proposing" but "EDUCATED GUESS". Given the data that we have on hand, which lacks dimensions, an educated guess is the best we can do at this point in time. For the purpose of an educated guess of something like the dimensions of an intersection from just a drawing, I have to take some standard dimensions for the elements that I can see in the drawing. So of course I wrote "2x3.0m thru lanes + 1x3.5m L-turn lane + 2x2.5m parking lanes"... because THOSE ELEMENTS ARE ALREADY IN THE DESIGN I'M ANALYSING!!!!! Look for yourself! You've got a drawing of it on this very post! I didn't put them in the design. If I'm trying to figure out how much space it occupies I can hardly ignore what's there just because you or I don't happen to like them. Again, this is not me PROPOSING but rather attempting to DESCRIBE a design. If you've got a problem with the Falbo design with its two parking lanes, two thru lanes and a left turn lane, go write a post about it or write to the designer - don't lay into me just because I tried to figure out for everyone's benefit how much space it was taking up and whether or not it would actually fit into downtown intersections across North America. And for the umpteenth time, I'm not trying to "shoe-horn" designs into spaces into which they can't; most of my comments on here have been about how various designs can't actually fit into the spaces we have. Where you get this shoe-horning nonsense from is beyond me. With the exception of old east coast cities built before 1800, the rest of the USA was built on a grid of streets, usually with 40 to 70 feet of roadway (including parking lanes) and 10 to 30 feet for sidewalks. If you look at central Portland Oregon, there are 60 to 70 feet of street width, building to building, with usually 40 to 50 feet of roadway. A few streets are wider. Most of the streets are now one-way, with many traffic signals. Downtown San Francisco, Los Angeles, Seattle, etc. are all similar. North Americans are looking for designs that fit with their view of a city center: big buildings in an extensive grid of moderately wide (but not huge) streets, currently dominated by car traffic and with street parking on each side. Dutch and English town often have a city center with traditional narrow streets (less than 40 feet building-to-building) with a few wider avenues, and newer suburban development from the 20th century around. North Americans usually have a core of moderately wide 60 to 100 foot streets on a repetitive grid, surrounded by more grid and eventually suburbs. All those wide streets were just begging for cars to be invented to fill them up with parking and traffic. Anyway, I think it is easier to fit bikes in narrow streets (less than 40 feet building-to-building) where there is not room for sidewalks+parking+driving. Here, you get rid of traffic lights and parking, and make it pedestrian and bike oriented. And it is also easier when you have more than 110 feet between buildings, when there is room for everything to be separated with plenty of room between modes. The in-between widths of 60 to 100 feet are difficult, because there is room for parking, driving, sidewalks and bike lanes, but not enough room to make everyone happy without compromise. Joseph, thank you for your comment, but I'm afraid you've still not actually understood the point that I've been making. You are suggesting that both narrow streets and wide streets can accommodate bicycles, but not those of the width which you have. This is absurd. There is no magic width of street where this cannot be done. The Netherlands has plenty of streets of a similar width to yours, newly built, and which took after American designs. Indeed, in the post WW2 period, many Dutch cities were transformed to closer resemble American cities. There are streets here of every possible width, from very narrow dating from a thousand years ago through to whole cities which didn't even start construction until the 1970s. In each case they were constructed in whichever manner was normal for that time. There is no single size of "European" streets, and Dutch cities certainly are not all of older designs. However, whether old or new, whether they were first designed to accommodate horses, bicycles or motor vehicles, there is one thing common to all Dutch cities now: They have all, regardless of their starting point, regardless of their street widths, been transformed to accommodate bicycles. On the other hand, the one thing common to almost all streets in countries other than the Netherlands, again regardless of their widths or original date of construction, is that they are clogged with motor vehicles. The Netherlands followed the same path until the 1970s, but then this country turned around and changed its streets a second time. US planners still seem to be stuck with a 1950s mindset and that's why your cities are full of traffic lights. The problem that you face is not a design issue of how to fit all those cars and also separate bike paths into any particular street width. The solution is to unravel routes for motorists from those for cyclists so that streets where you do not wish to accommodate motor vehicles no longer have to accommodate motor vehicles. As the author of the blog post at caa.org.nz that led to David seeing the Christchurch intersection design, I would just make one point. NZ has traffic lights on both sides of the intersection (unlike in Europe) so that may be one reason the NZ designers didnt think it was so important to put the cyclist in a position to see the near side lights. Also, a Chch author has written a reply to David on his blog which has sparked an interesting discussion (http://cyclingchristchurch.co.nz/2014/02/23/are-the-chch-cycle-design-guidelines-up-to-scratch/). In saying that, I really appreciate David H's approach and I think it is great that he takes the time to analyse and comment. I agree with what he says and firmly believe that we in the Anglophone world need to follow Dutch practice. There is nothing special about Anglophone countries travel habits except that we have wholeheartedly turned our cities over to one mode of travel the private motor car. Also, David understands the grid system of New World cities very well, having grown up in Auckland (the LA of the South Pacific). I think you will find he is not as Euro-centric as some of you would like to believe. The "enemy" here are our so called leaders, who are happy to sit by and see people die in traffic crashes and of obesity rather than change things - not other cycle advocates. The Dutch way is the only method to getting a diverse demographic of people on bicycles - young, old, male, female, brave, timid. David, it's always a treat when you stop by one of our posts. You make useful critiques about Austin's recent proposals, though from reading them I'm not sure about the specific problems you're calling out. With the Lamar/Riverside image, you say there are not currently any bike-friendly northbound or eastbound routes. True, but this doesn't seem to make the intersection pointless. 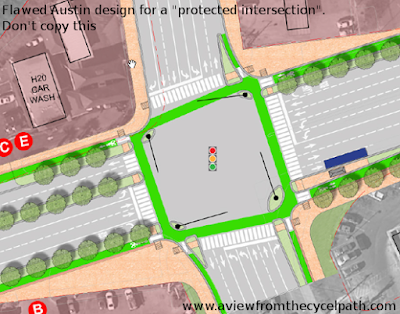 With the huge Lamar/Barton Springs intersection, I wouldn't ever refer to such a vast expanse as "bike-friendly" but the corner refuge islands would seem to make it better than it might have been. If there were multiple right-turn lanes that might be different, but there aren't. You argue that the effect on southbound traffic turning east is to soften the turn radius and therefore to encourage auto speed, which seems like a good point to me. But other than that, is this design making things worse than a traditional US junction would? Michael: I think you've misunderstood my criticism of the first junction. The lack of cycle-paths north and east from the junction is actually not a problem at all so far as the junction is concerned. There are well established and very safe ways of making a segregated junction work with a non-segregrated road. My criticism is that the designers of your junction ignored this issue altogether, resulting in a dangerous situation where you must make two 90 degree turns simply to continue in a straight line. They have misunderstood the entire point of the protective buffer, which is to protect cyclists, and managed to install them in such a way that they actually increase danger to cyclists. The huge junction is simply far too huge for this approach. This is the result of the designers not understanding that there is no "one size fits all" safe junction design. Whether this might or might not be fractionally safer than the situation before is not the point. You're building an inferior design which is the result of ignorance on the part of the designers. We demonstrate both large and small junctions on our study tours. It would have cost your designers a lot less time and money to have come and taken a look at how such things can be done safely than to implement a dangerous design like this one based on misunderstandings. Ah, thanks, David. You're right, I did misunderstand what you were saying about Lamar/Riverside. I think you might have (understandably) missed the fact that there's a multi-use path running through the middle of this junction, connecting to a bike-walk bridge across the river that's flying off the right side of the frame. I think this bike traffic pattern removes some of the 90-degree turns that you're (understandably) objecting to. P.S. The path also seems to create a salmoning problem as it goes through the intersection, but I suppose that's a different matter. Michael: Thanks for that reply. It certainly adds something that there's a different route for cyclists from that point, along the trail. But it also makes the choice of this type of intersection even more strange, because this is really now just a road crossing. The Google Map view suggests that this too is a colossal road with much traffic on it, leading to other intersections of a similar scale, none of which are appropriate for this type of intersection which really only applies to smaller situations. Quite apart from the problem of an unsuitable context for such an intersection type, there's also a problem here in that there's seemingly an attempt to tackle just a few intersections when actually the entire road network needs to be looked at and the purposes for individual roads need to be determined. This process of deciding what each road is supposed to do and what form it should take needs to take place before trying to change individual junctions. Cyclists should see so few traffic lights as possible because the roads which they cycle upon should not always be the roads on which drivers drive. The pattern of traffic lights across Dutch towns looks different because of this re-organisation of roads. Austin is attempting to take step number 10 before taking steps 1 through to 9. This intersection in Vancouver has gotten almost all the details right for a protected intersection: http://edmontonbikes.ca/uploads/post/before-and-after-transforming-a-15-lane-pedestrian-crossing/Burrard-and-Cornwall-after.jpg. The cycleways are wide, smooth, efficient, and on the desire lines. The corner radii for cyclists is wide enough to keep a high speed through the turn, the light signal stages are separated by direction and type, and the only two flaws I see are minor. There is no corner refuge island for Eastbound cyclists, but this is a minor issue that could be resolved within a few minute by putting something like a few plastic bollards strapped together, even that would work well enough until someone could use some concrete. The second issue is related to the first, though close to irrelevant. You technically have to stop and then turn right going Eastbound to Southbound on red, but almost never do the police enforce it and almost nobody on bicycle ever observes that rule. You see people wearing helmets mostly because provincial law requires it, but a considerable fraction of them do not wear helmets. There is even a shortcut to a residential road, not usable by motor vehicles. It does not use simultaneous green, but still works just as well as intersections similar in design to this in the Netherlands does. The volume of cyclists proves that it is a popular way to get around in this area of Vancouver. They are planning more intersections like this, the next at the north end of the bridge. It is a good inspiration to traffic engineers looking for proof that it can work in North America. I apologize if this is a duplicate post, I had some difficulty submitting this post. It appears to me that an American authority finally got the details right. In the introduction to their design guide, the secretary of the Massachusetts Department of Transportation states the following: "[...] we hope [to] set new precedents for design in the United States." Would anyone care to comment on whether these design principals are in fact sound? I don't see any compromises here. Hi Lars, I've not read every word at your links but I have now had a chance to look at them. Unfortunately, no they've not now got the details right. The very first picture in the intersections document shows a conflict between a cyclist going straight with a driver turning right. Later on in the document there are references to reducing corner radii in a hope that this will "improve yielding". Unfortunately, that's not good design at all. These conflicts, and the danger which comes with them, are completely removed by proper junction design, such as that which you'll find that I advocate in my series of articles about traffic light junctions. "Mixing zones" are also discussed in the document. mI'm afraid these are simply a bad idea. The few which remain in the Netherlands are dangerous here, and those which are found in Copenhagen regularly kill cyclists. There is no "good" mixing zone. These are a dangerous and undesirable type of infrastructure. The roundabout design which appears in the document appears to be the result of a complete misunderstanding. 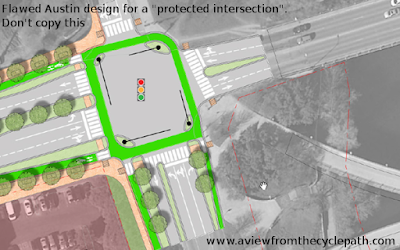 They've taken an approximation (but without the sight lines) of the truly safe roundabout design's geometry but the priority is wrong and the suggestion is to build it with only single-direction cycle-paths, which halves the usefullness of the safe roundabout design for cyclists. The safety of the design comes in large part because cyclists yield on those roundabouts. The efficiency comes because adequate sight-lines are provided so that cyclists can almost always predict this requirement so very rarely actually stop, because they can travel in both directions around the roundabout and take shortcuts and because the roundabout design should only be used with very low traffic levels. It goes on. There are also two stage turn queue boxes (simply a bad idea), and an incredibly stupid convoluted design for "transition from a two-way separated bike lane" onto the road shown as exhibit 4AJ. Cyclists who wish to make a left turn have to cross not one but three roads with a design as drawn in that diagram ! Why ? Their chosen photographs from the Netherlands are mostly of older and poorer infrastructure. Meanwhile, their own diagrams all show cycle-paths which are so narrow that they do not allow cyclists to travel side by side, thereby making cycling both less convenient and less pleasant. I'm afraid that this document is just yet another of a series from the US through which bad practice is being foisted on cyclists.